TweetUp has purchases Android Twitter App Twidroid, and they will be releasing the app under a new name called Twidroyd, and according to TweetUp it will come pre-loaded on upcoming Android smartphones from the five major Android smartphone manufacturers. PASADENA, Calif.–(BUSINESS WIRE)–TweetUp, Inc., announced today that it had acquired Twidroid, creator of the most popular and highest-rated Twitter client for Android phones. Android-powered devices constitute the fastest growing segment of the popular smart-phone market. 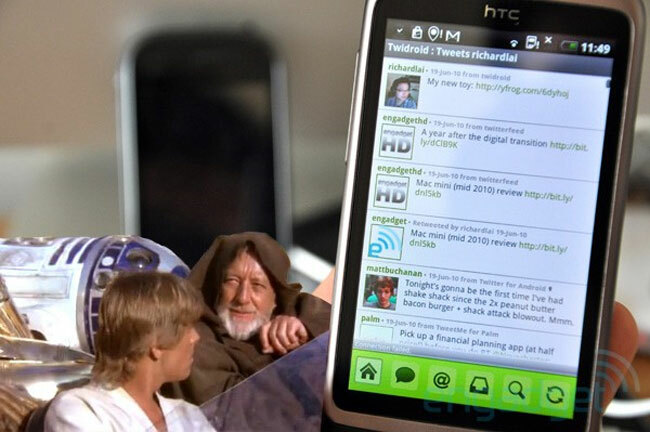 The company also announced that the application will be renamed Twidroyd in order to ensure minimal confusion with products from Lucas Films, trademark owner of the term “droid,” and will come standard on millions of upcoming Android phones from five of the leading handset manufacturers. As part of the transaction, TweetUp, Inc. will also acquire popurls®, which aggregates in one location the most popular items from the New York Times, Twitter, Digg, Delicious, Reddit, YouTube, Flickr and other news and social media sites. Combined, Twidroid and popurls will provide TweetUp with a broad distribution network on which to test and refine its platform for finding the world’s best tweeters. In April, TweetUp opened registration for the world’s first bidded marketplace for real time search, and in May the company launched its search capabilities at TechCrunch, Topix.com, and Businessinsider.com. TweetUp’s core search algorithms, in combination with this marketplace, address the needs of both users and tweeters in a single search mechanism. In addition to algorithms that combine a variety of factors to determine relevance, tweeters will soon be able to bid on keywords in a competitive marketplace very similar to what now occurs at Internet search engines. This sophisticated combination of factors pushes the most relevant tweeters to the top of the results of users’ searches, and it enables serious tweeters to expand their following quickly and cost-effectively. TweetUp’s search results will be available to hundreds of millions of individuals through revenue-sharing agreements with a wide range of partners. These include leading Twitter clients TweetDeck, Seesmic, and Twidroyd; the leading provider of custom browser and desktop toolbars, Conduit; the leading personalization platform for the web, Netvibes; one of the leading sources of tweets, TwitterFeed; one of the leading social media authority and influence ranking systems, Klout; as well as popular web sites including BusinessInsider.com, Answers.com, TechCrunch, Topix.com and popurls. Some sites have already begun to serve search results, and the others will come online over the next few weeks. Together, these clients and web sites will bring TweetUp search results to more than 40 million unique users per month and serve more than 100 million impressions per month. TweetUp (www.tweetup.com) is a product of Idealab (www.idealab.com), where Bill Gross also devised the first model for paid internet search, Overture/Goto.com, over a decade ago. Then, like now, the goal was creating a business model that would both improve the relevance of search results and enable a steady revenue stream for publishers. Today, the amount of noise in the Twitter feed is crying out for a similar solution, and TweetUp was formed to provide it. TweetUp is backed by Index Ventures, betaworks, Steve Case’s Revolution LLC, First Round Capital, Jason Calacanis and Jeff Jarvis.